Recently, I stumbled into a scenario where Lync Online accounts appeared to get crunched by a series of enabling and disabling DirSync within the Office 365 tenant. Getting the issue resolved was enough a puzzle that I figured it was worth sharing. In this case, the users had been assigned Lync Online licenses within Office 365 and had been successfully using the Lync client for several months until DirSync was re-enabled for the tenant. 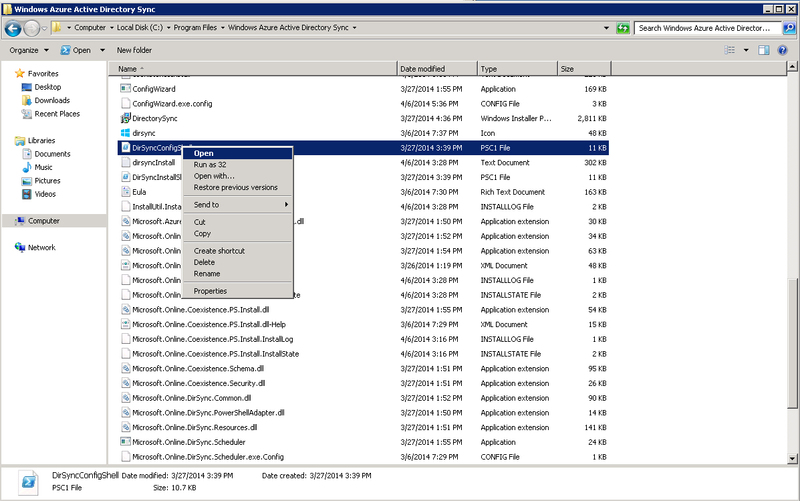 Once DirSync had been re-established, the users immediately lost the ability to log into the Lync client and were no longer visible as Lync Users in the Lync Online Admin panel. The first thought was that SIP entries had gotten overwritten or misconfigured in the properties of the on-prem AD user, but all SIP-related addresses, proxies and DNS entries all appeared to be correct. It turned out that Lync Server 2010 had been deployed (and later decommissioned) on-premises at some point, extending the local Active Directory schema with Lync attributes. The users that were affected by this issue each had multiple attributes defined in the properties of their local Active Directory that correlated to the internal implementation of Lync Server – a fact that should have prevented the users from accessing Lync Online since the initial DirSync was performed. In this case, no on-prem Lync deployments were present (or planned in the future), so these attributes (beginning with msRTCSIP) could be removed. To restore Lync Online usage, several attributes had to be cleared for the internal AD accounts, a full DirSync synchronization was performed and lastly Lync Online licenses were removed and reassigned to the affected users. 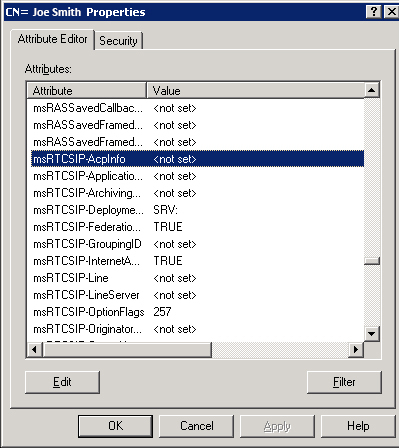 Using ADSI-Edit, the properties of each affected user were viewed and all attributes beginning with “msRTCSIP” were cleared, setting the values to <not set>. Once the String Attribute Editor window appears, click the “Clear” button. At that point, the value should be reset to “<not set>“, as shown below. Repeat this process for each msRTCSIP attribute that contains a value other than not set. Once the DirSyncConfigShell is located, right-click and select “Open“, as shown below. The script should run and you will be returned to the prompt as seen above. 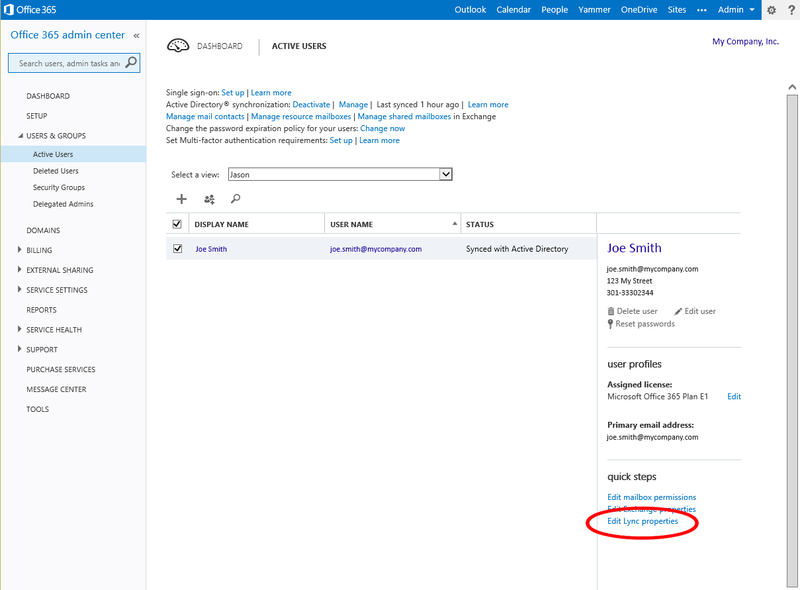 From the Office 365 Admin – Users & Groups screen, click on the display name of the affected user. Next, Click “licenses” from the left menu. Remove the checkmark next to “Lync Online“, and click the “save” button at the bottom of the page (as depicted below). Repeat the steps show in the previous step, but this time you will select (check) the Lync Online license for the user. Once the license is re-assigned, the user will be provisioned for Lync Online. This process may take several hours. When the process is complete, the user will appear in the Lync Admin – Users screen and they will be able to sign in using the Lync client. thanks for this! saved me a bunch of time! Thanks for posting this – it solves the exact problem we were having with trying to enable Lync Online for users during our migration from on-premise to cloud. Your article missed a key component which I still had and it took me ages to work it out. There is an extra attrib missing from your article. Rick, we can’t thank you enough for sharing this! Solved our issue as well.